Lancaster has finally organised its event for parkrun, a national phenomenon which has gradually swept the nation since 2004. In news that should hopefully please those who have made New Year’s resolutions to lose weight and keep fit, the national phenomenon of Parkrun will be making its way to Lancaster for 2016. Despite being founded in 2004, this free weekly event has only just reached Lancaster, although there were rumours of it surfacing sometime in 2015. The concept is remarkably simple. You run. Well it’s a little more colourful than that to be fair. Lancaster’s Parkrun will be held in Williamson Park, taking in the beautiful surroundings of the Ashton Memorial. Runs take place every Saturday morning at 9am, starting in Lanacaster on Saturday 9th January. The event is completely free, and open to all runners of all abilities, and Lancaster University’s Running Club has already expressed joy upon hearing about this development. The 5k run is organised by a group of volunteers, who are described as integral for the continuation of this non-profit organisation. The run is also timed, providing one brings along their personal barcode, which is available upon registration. The concept started in 2004, and featured slim numbers compared to the thousands who participate every weekend across the country and the world. Originating in Britain, the efficiency and enthusiasm associated with this event meant it has emigrated to multiple countries since, including Australia, Russia and South Africa, to name just a few. But Britain is still ultimately at the heart of the event, with 373 registered courses. However this does raise the question of why it took so long for Lancaster to finally get its own event, considering the stature of the University’s running club, amongst other factors. Attempts had been made in the past, but to no avail. Hopefully 2016 will be the year that Parkrun hits the ground running in Lancaster. Compared to some other events across the UK , Lancaster’s seems a little complex at first glance. 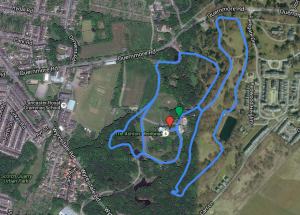 The course consists of two loops and two laps, and involves running on the woodland trails scattered around Williamson Park. The variation of different terrains should prove an enjoyable challenge for runners, not to mention the elevation changes throughout the course. Whether Parkrun succeeds in Lancaster depends on a number of parameters. The demand must be consistent, as Parkrun relies on willing volunteers as well as a healthy number of competitors. This also means persevering with Lancaster’s notorious weather system, which operates on a temperamental basis at best. It also must be acknowledged that attendance will be at its best during term time, since Lancaster is such a student-heavy city. However, judging by its resounding popularity across the country, there should be no doubt that Parkrun will be the success it deserves to be.